Meet the utterly unnecessary and batshit-fabulous Trecol 39294 6×6. You can keep your Hummer. We want one of these. 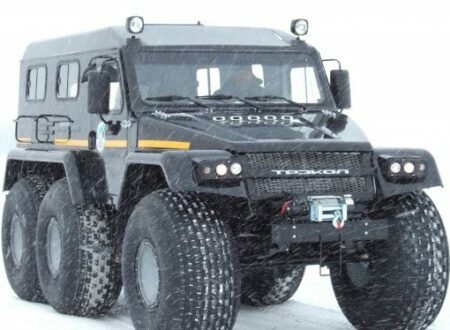 Designed for use by the Russian military, Trecol are now selling these zombie-crunchers to civilians who find themselves needing an amphibious, six-wheel-drive hell-mobile. The 39294 has a top speed of 80kph but it’ll do that speed over any surface (think snow, ice, tundra, peasants and desert sand), it seats 8 in comfort and has a temperature operating range of -60C to +60C.